Sun. 3/24: End of Season Ski Party, Free trail passes, Free BBQ and Bevvies. Shop sale 30% and more discounts. Remaining ski, boot pole inventory even cheaper. Slab Pro Skate boot sizes, UK 5, 5.5,6,6.5,9, 9.5. Slab classic UK 10, Escape 7 Touring boot, UK 5.5, 11, 11.5, 12. Skis, skintec 195, Motion touring 198, Atomic s-7 Skate 180, Atomic WC Classic 206. Winter Lodge/Trail Hours: 9:30-4:30. Dog Trails open. Homestake Lodge located in a high valley on the Continental Divide, surrounded by the United States Forest Service awaits your visit. Come stay and enjoy cross country skiing and snowshoeing during the Winter or, biking, hiking and walking on beautiful trails. 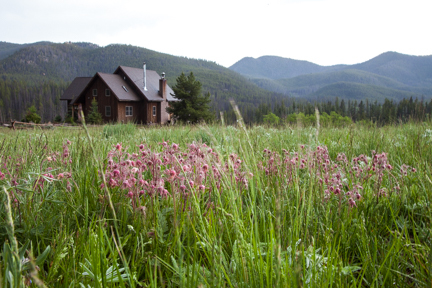 Peace, beauty, and privacy is yours with a visit to Homestake Lodge.